The closest thing to home made. Super Strawberry Jam is made with juicy strawberries that are hand-stirred in open pans for a rich texture and flavor. Finest quality selection, no artificial flavorings or colorings. A wonderful flavor to find at breakfast, brunch, lunch or even enjoying a spoonful of dessert. Treat yourself or a loved one to something special such as this Super Strawberry Jam from The Jam Stand. Spread the love! They believe that good things put together can create something better. That’s why unusual collaborations are always at the heart of the Jam Stand. These funky inventive spreads taste best in great company. So, whenever you’re looking for an inspired spread, a secret ingredient, or a midnight snack, the Jam Stand has your back. 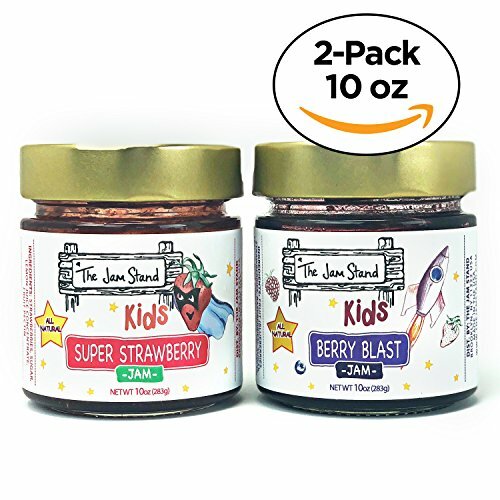 A favorite for the kids, Super Strawberry Jam and Berry Blast Jam, to boost your kid's breakfast, pancakes, waffles, yogurt, oatmeal and more! This is healthy, sweet and delicious. Kids favorite for sure! No artificial preservatives. Net weight: 10 oz. Pack of 02. If you have any questions about this product by The Jam Stand, contact us by completing and submitting the form below. If you are looking for a specif part number, please include it with your message.